In 2011 my life was flipped upside down. 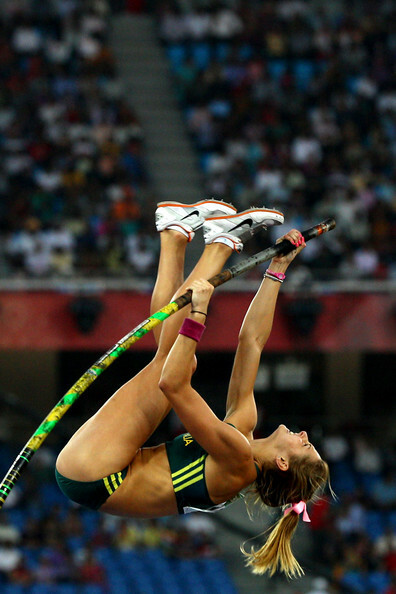 It had been six months since I had competed for Australia in the womens pole vault at the 2010 Commonwealth Games in New Delhi, India. I came home with the London Olympics set in my sights and had started the first block of training towards my dream. Ever since I was a little girl I knew I wanted to be an Olympic athlete, and here I was preparing for something I had wanted all my life. I started to struggle to recover from my training sessions and generally felt drained during the day. As a naturally energetic and bubbly person, this didn't feel like me. Over the coming months my symptoms continued to get worse, even with more and more hours sleep. I started to wake up feeling like I had no sleep at all, I felt flu-ish all the time, my glands were swollen and I was getting light headed all the time. I visited the doctor week after week, was directed to specialists for tests, took my iron and B vitamin supplements, had a lighter training load and more days off. All I wanted was to train and to be me again. I had lost my spark but no one had the solution. My tests were coming back clear but I was feeling worse. Not knowing what was wrong was breaking me. After months of wondering, I was finally diagnosed with chronic fatigue. Through the many months of trying everything I could to recover and get back to normal, there was one thing I hadn't tried yet. Stopping pole vault. Battling this decision in my mind, I met with my coach, Alex. Alex was there for me not only in my athletics world but also in my day to day life. If one person was to understand what I was going through, it would be him. He was a world class athlete himself, one of the best, and he too had to cut short his athletic career because of injury. He understood I had to give my body a chance to recover. And he understood the pain of giving up the one thing I loved most in my life. The dream I had grown up with since I was a little girl felt like it was ripped from my grasp. I was lost for some time after this. For the first time in my life the routine of training everyday was gone. I isolated myself from the track. I couldn't face the questions, I even found it hard to talk about it with my own family. It was such a painful time in my life that I just wanted to pretend athletics never existed. I just simplified my life. I had amazing people around me who really helped me through the months following my diagnosis. One person in particular picked me up every time I was down. My partner Adam. I had met him early in 2011, during the time I was trying to train and compete with Chronic fatigue. He was there through the struggle and through my lowest point, but every time I broke down he reminded me never to give up. He inspired me to take a situation and make the best of it. Including taking control of my own recovery. During one visit to the doctor towards the end of 2011 I was prescribed anti depressants to help with my symptoms. Something didn't sit well with me when I got home after that visit. I just didn't feel right putting my faith in a little pill to help me feel better. I came home with the packet in hand, stood for a moment and then threw it in the bin. From that point, I was in control. I began to learn about health and nutrition. I had learnt the basics while completing my Bachelor Degree in Sport Science, but now I wanted to expand this knowledge into something I could use for me and my health. I read books, explored the internet, went over my university notes, spoke to nutritionists and just immersed myself in information. This is where my passion for health really started to grow. I realised that the most fundamental element impacting my health was the decisions I was making everyday. Decisions about what to eat, how to move, what to think, everything. The more I learnt, the better decisions I made each day. And I began to see a change. It took a little while, but I started to develop a different perspective of food. I now saw each meal as a chance to heal my body and feed it healthy and nourishing food. As the weeks and months went by I noticed I was starting to feel better. I still had good and bad days, but the days I felt really horrible started to fade away. Having isolated myself from any form of exercise for months, and now that I was gradually feeling better, I thought I would try yoga. I was the middle of 2012. I felt this was the perfect way to begin moving my body and to refresh and recharge my mind. Slowly I began to do yoga and stretching at home everyday and bit by bit I began to introduce other exercise such as walking, swimming and body weight strength. The biggest thing however, was that I learnt to listen to my body. If i didn't feel like going for a walk I would just do a little 15 minute stretch at home. Just something small everyday. This helped me build a routine and my exercise time started to feel like me time. A way to tune into and understand the way I was feeling. It has been a long road since 2011 but I am thankful for every step of the journey. In the last few years I have learnt the most about myself and how I want to live my life. The way I live now involves some simple philosophies that I follow everyday. It has taken me a while to find what works for me and it involved hitting my lowest point, but through this I really began to understand not only my limits but also what makes me thrive. There were many times along the way where it felt like I would never get the old me back again but the one thing that stopped me from giving up was understanding that every positive effort I was putting in, no matter how small, was helping me grow. Changing my mindset to see the positive in every situation has changed my path and my experience of life. Its all about the little efforts I put in, the steps I take and the little accomplishments along the way. They all build up and they all bring me happiness. Never stop making your life what you want it to be.